Hundreds of volunteers are taking part in a beach clean-up in Cornwall for the Marine Conservation Society (MCS). 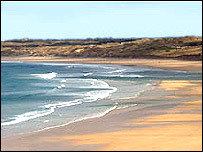 As part of the annual Beachwatch, 27 beaches around the county's coast will be cleaned over the weekend. The MCS says much of the rubbish to be collected will have been thrown overboard from ships. The beaches being targeted are spread throughout the county from Summerleaze near Bude in the north, to Gunwalloe in the west. The society says the clean-up improves the environment and collects important information for dealing with the causes of beach litter. Conservationists say much of the rubbish is regularly swallowed by fish and other marine wildlife with fatal consequences. Last year, more than 250,000 pieces of beach litter were cleared up.